Nintendo Gives Away Free Gas In LA...Didn't We Just Write This? Filed to: Wario World: Shake It!Filed to: Wario World: Shake It! We thought EA giving away free gasoline in Los Angeles was a pretty nifty way to promote Mercenaries 2. Apparently so did Nintendo, as they showed up at an LA-area Mobile station this morning to dole out courtesy life-giving automotive blood to thankful motorists in order to promote the release of Wario Land: Shake It! See, Wario tends to fart a great deal, and thus he has gas, therefor...free gas. I'll pause while you ROFL in you preferred manner. Me? I'm all about ROFLcoptering myself. Done? Good. 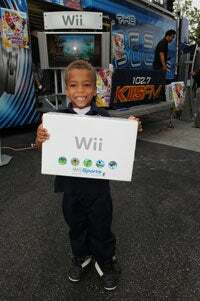 Nintendo has passed along some shots of the event, including one of a lucky 9-year-old who walked away with a Wii and a copy of the game. Despite being a little less original than it would have been a month ago, fully approve of giving away free gas as often as possible, even if the Brits don't quite agree.